I am so convinced of the advantages of looking at mankind instead of reading about them, and of the bitter effects of staying at home with all the narrow prejudices of an Islander, that I think there should be a law amongst us to set our young men abroad for a term among the few allies our wars have left us. The other day I was playing around with how to do cascading drop-down lists using only declarative markup. But as I said then, that works only if you have a straightforward scenario, as in two standalone DropDownList controls just somewhere on the page. 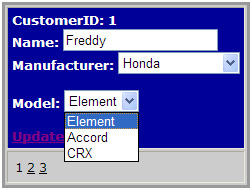 Another common situation is having the drop-down lists inside the template of a data-bound control. I showed an example of an all-declarative drop-down list in a FormView control a while back, but that was just a single drop-down inside the template. This specific scenario doesn’t quite work correctly in a FormView control because when the DataSource raises its DataSourceChanged event, the second dropdown list’s Eval statement attempts to evaluate against the container’s (FormView’s) databinding context, which is only valid at DataBind time. Since this happens outside of DataBind time, the context isn’t there and the Eval fails. The best way to work around this is to write some code to manually databind either the second (dependent) dropdown list. Dang. As Polita told me later, "There are lots of ways to do this." So here's one. Note: Lines are wrapped so they'll fit here. Note that the AutoPostBack property is set to true; more on that in a sec. Dynamically get the parameter value for the second data source control (from the selected value of the first drop-down list) and then bind the second drop-down list to that data source. Pass the selected value of the second drop-down list to the FormView control when it's doing an update. (Normally this would be auto-magically handled by a declarative Bind call, but we're not using that for this control). Update the items in the second drop-down list when the first one changes -- the second list, after all, is dependent on the first. This is why we needed to set AutoPostBack to true for the first drop-down list -- so that it will raise an event we can handle to repopulate the second drop-down list. I wouldn't be surprised to hear that there is a more efficient way to do this, but this seems to work. You can see the code in action here. And since these little snippets are way out of context, you can see the source code for the entire page here.